Cable-Satellite Public Affairs Network (C-SPAN; /ˈsiːˌspæn/) is an American cable and satellite television network that was created in 1979 by the cable television industry as a nonprofit public service. It televises many proceedings of the United States federal government, as well as other public affairs programming. The C-SPAN network includes the television channels C-SPAN, C-SPAN2, and C-SPAN3, the radio station WCSP-FM, and a group of websites which provide streaming media and archives of C-SPAN programs. C-SPAN's television channels are available to approximately 100 million cable and satellite households within the United States, while WCSP-FM is broadcast on FM radio in Washington, D.C. and is available throughout the U.S. on SiriusXM via Internet streaming, and globally through apps for iOS, BlackBerry, and Android devices. The network televises U.S. political events, particularly live and "gavel-to-gavel" coverage of the U.S. Congress, as well as occasional proceedings of the Canadian, Australian and British Parliaments (including the weekly Prime Minister's Questions) and other major events worldwide. Its coverage of political and policy events is unmoderated, providing the audience with unfiltered information about politics and government. Non-political coverage includes historical programming, programs dedicated to non-fiction books, and interview programs with noteworthy individuals associated with public policy. C-SPAN is a private, non-profit organization funded by its cable and satellite affiliates, and it does not have advertisements on any of its networks, radio stations, or websites, nor does it solicit donations or pledges. The network operates independently, and neither the cable industry nor Congress has control of its programming content. 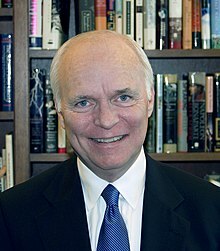 Brian Lamb, C-SPAN's chairman and former chief executive officer, first conceived the concept of C-SPAN in 1975 while working as the Washington, D.C. bureau chief of the cable industry trade magazine Cablevision. It was a time of rapid growth in the number of cable television channels available in the United States, and Lamb envisioned a cable-industry financed nonprofit network for televising sessions of the U.S. Congress and other public affairs event and policy discussions. Lamb shared his idea with several cable executives, who helped him launch the network. Among them were Bob Rosencrans, who provided $25,000 of initial funding in 1979, and John D. Evans, who provided the wiring and access to the headend needed for the distribution of the C-SPAN signal. 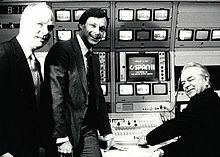 According to a report from commentator Jeff Greenfield on Nightline in 1980, C-SPAN was launched to provide televised coverage of U.S. political events in its entirety, thus helping viewers maintaining a thorough view of politics and especially presidential campaigns, unlike television newscasts which "does not really inform us about what the candidates mean to do with the power they ask of us." C-SPAN was launched on March 19, 1979, in time for the first televised session made available by the House of Representatives, beginning with a speech by then-Tennessee representative Al Gore. Upon its debut, only 3.5 million homes were wired for C-SPAN, and the network had just three employees. C-SPAN began full-time operations in September 14, 1982. The second C-SPAN channel, C-SPAN2, followed on June 2, 1986 when the U.S. Senate permitted itself to be televised. It began full-time operations in January 5, 1987. C-SPAN3, the most recent expansion channel, began full-time operations on January 22, 2001, and shows live/taped public policy and government-related events on weekdays, with historical programming being shown on weeknights and weekends. It has also sometimes served as an overflow channel for live programming conflicts on C-SPAN and C-SPAN2. C-SPAN3 is the successor of a digital channel called C-SPAN Extra, which was launched in the Washington D.C. area in 1997, and televised live and recorded political events from 9:00 a.m. to 6:00 p.m. Eastern Time Monday through Friday. On January 12, 2017, the online feed for C-SPAN1 was interrupted and replaced by a feed from the Russian television network RT America for approximately 10 minutes. C-SPAN announced that they were troubleshooting the incident and were "operating under the assumption that it was an internal routing issue." C-SPAN's logo from 1991, to the day before its 40th anniversary on March 18, 2019. The logo has taken different design cues, coloring, and been rendered in 3-D in various times, depending on logo design trends over the years and decades. To commemorate 25 years of taking viewer telephone calls, in 2005, C-SPAN had a 25-hour "call-in marathon", from 8:00 pm. Eastern Time on Friday, October 7, concluding at 9:00 pm. Eastern Time on Saturday, October 8. The network also had a viewer essay contest, the winner of which was invited to co-host an hour of the broadcast from C-SPAN's Capitol Hill studios. On June 22 and into June 23, 2016, C-SPAN took video footage of the House floor from individual House representatives via streaming services Periscope and Facebook Live during a sit-in by House Democrats asking for a vote on gun control measures after the 2016 Orlando nightclub shooting. This needed to be done because—as the sit-in was done out of formal session and while the House was in official recess—the existing House cameras could not be utilized for coverage of the event by rule. Although the use of electronic devices to create the Periscope feeds by House Democrats violated House rules that prohibit their use on the floor, C-SPAN did not state why it chose to broadcast those feeds. The network ran disclaimers on-air and on their official social media feeds noting the restrictions. As part of the network's 40th anniversary, C-SPAN instituted the first logo change in the network's history on March 18, 2019. The C-SPAN network's core programming is live coverage of the U.S. House and Senate, with the C-SPAN channel emphasizing the United States House of Representatives. Between 1979 and May 2011, the network televised more than 24,246 hours of floor action. C-SPAN2, the first of the C-SPAN spin-off networks, provides uninterrupted live coverage of the United States Senate. With coverage of the House and Senate, viewers can track legislation as it moves through both bodies of Congress. Important debates in Congress that C-SPAN has covered live include the Persian Gulf conflict during 1991, and the House impeachment vote and Senate trial of President Bill Clinton in 1998 and 1999. When the House or Senate are not in session, C-SPAN channels broadcast other public affairs programming and recordings of previous events. With its public affairs programming, C-SPAN intends to offer different viewpoints by allowing time for multiple opinions to be discussed on a given topic. For example, in 2004 C-SPAN intended to televise a speech by Holocaust historian Deborah Lipstadt adjacent to a speech by Holocaust denier David Irving, who had unsuccessfully sued Lipstadt for libel in the United Kingdom four years earlier; C-SPAN was criticized for its use of the word "balance" to describe the plan to cover both Lipstadt and Irving. When Lipstadt ended media access to her speech, C-SPAN canceled coverage of both. The network strives for neutrality and a lack of bias; in all programming when on-camera hosts are present their role is simply to facilitate and explain proceedings to the viewer. Due to this policy, C-SPAN hosts do not state their names on television. While many hours of programming on C-SPAN are dedicated to coverage of the House, the network's daily programming begins with the political phone-in and interview program Washington Journal from 7:00 to 10:00 a.m. Eastern Time. Washington Journal premiered on January 4, 1995 and has been broadcast every morning since then, with guests including elected officials, government administrators, and journalists. The program covers current events, with guests answering questions on topics provided by the hosts as well as from members of the general public. On weeknights C-SPAN2 dedicates its schedule to Politics and Public Policy Today (9:00 p.m. – midnight for the East Coast primetime, replayed immediately for the West Coast primetime), which is a block of recordings of the day's noteworthy events in rapid succession. On the weekend schedule, C-SPAN's main programs are: America and the Courts, which is shown each Saturday at 7:00 p.m. Eastern Time, Newsmakers, a Sunday morning interview program with newsworthy guests; Q&A, a Sunday evening interview program hosted by Brian Lamb, with guests including journalists, politicians, authors, and other public figures; and The Communicators, which features interviews with journalists, government officials, and businesspeople involved with the communications industry and related legislation. The weekday programming on C-SPAN3 (from the morning (anywhere from 6:00-8:30 a.m.) to 8:00 p.m. Eastern Time) features uninterrupted live public affairs events, in particular political events from Washington, D.C. Each weekend since January 8, 2011, the network has broadcast 48 hours of programming dedicated to the history of the United States, under the umbrella title American History TV. The programming covers the history of the U.S. from the founding of the nation through the late 20th century. Programs include American Artifacts, which is dedicated to exploring museums, archives and historical sites, and Lectures in History, featuring major university history professors giving lectures on U.S. history. In 2009, C-SPAN3 aired an eight-installment series of interviews from the Robert J. Dole Institute of Politics at the University of Kansas, which featured historian Richard Norton Smith and Vice President Walter Mondale, among other interviewees. C-SPAN archival video is available through the C-SPAN Video Library, maintained at the Purdue Research Park in West Lafayette, Indiana. 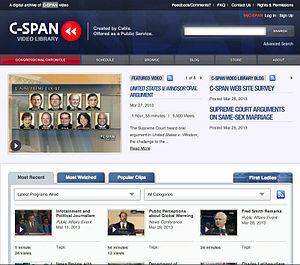 First unveiled in August 2007, the C-SPAN Video Library contains all of the network's programming since 1987, totaling more than 160,000 hours at its completion of digitization and public debut in March 2010. Older C-SPAN programming continues to be added to the library, dating back to the beginning of the network in 1979, and some limited earlier footage from the National Archives, such as film clips of Richard Nixon's 1972 trip to China, is available as well. Most of the recordings before 1987 (when the C-SPAN Archive was established) were not saved, except for approximately 10,000 hours of video which are slated to be made available online. As of April 2019[update], the C-SPAN Video Library held over 249,000 hours of programming, and they have been viewed over 246,6 million times. Described by media commentators as a major educational service and a valuable resource for researchers of politics and history, the C-SPAN Video Library has also had a major role in media and opposition research in several U.S. political campaigns. It won a Peabody Award in 2010 "for creating an enduring archive of the history of American policymaking, and for providing it as a free, user-friendly public service." On July 29, 2014, C-SPAN announced that it would begin restricting access to the live feeds of the main channel, C-SPAN2 and C-SPAN3 to subscribers of cable or satellite providers later that summer, citing concerns with the slow shift in viewing habits from cable television to the internet due to its reliance on carriage fees from cable and satellite providers. However, it will continue to allow all government meetings, hearings and conferences to be streamed live online and via archived on the C-SPAN Video Library without requiring an authenticated login by a provider; live audio feeds of all three channels are also available for free through the network's mobile app. The decision drew some criticism from public interest and government transparency advocates, citing the fact that C-SPAN was designed as a public service. As of 2012[update], C-SPAN received 6¢ of each subscriber's cable bill for an annual budget of $60 million. As the network is an independent entity, neither the cable industry nor Congress controls the content of its programming. As of January 2013[update], the network has 282 employees. C-SPAN is led by co-CEOs Rob Kennedy and Susan Swain. Founder and former CEO Brian Lamb serves as the executive chairman of the board of directors. The majority of C-SPAN's employees are based at C-SPAN's headquarters located on Capitol Hill in Washington, D.C., however in 2003 television studios were opened in New York City and Denver, Colorado. These studios use digital equipment that can be controlled from Washington. In February 2017, Ipsos Audience conducted another survey which showed that 70 million adults, or 36% of adults with access to cable television, watch C-SPAN on a given six-month period. Of the 70 million regular C-SPAN viewers, 52% are male and 48% female; 25% are West viewers, 22% Midwest, 20% Northeast and 33% South. 28% identified themselves as liberal, 27% conservative, and 36% moderate. 51% of all viewers are 18-44 years old. Despite its stated commitment to providing politically balanced programming, C-SPAN and its shows such as Washington Journal, Booknotes, Q & A, and After Words have been accused by some liberal organizations of having a conservative bias. In 2005, the media criticism organization Fairness and Accuracy in Reporting (FAIR) released a study of C-SPAN's morning telephone call-in show Washington Journal, showing that Republicans were favored as guests over Democrats by a two-to-one margin during a six-month period that year, and that people of color are underrepresented. A 2007 survey released by the think tank Center for Economic and Policy Research reported that C-SPAN covered conservative think tanks more than left-of-center think tanks. ^ a b c "How to Listen to C-SPAN Radio". c-span.org. C-SPAN. Archived from the original on January 4, 2012. Retrieved June 20, 2013. ^ "AMC 10 at 135.0°W". lyngsat.com. LyngSat. June 21, 2013. Retrieved June 24, 2013. ^ Booth, David R. (2010). Peer Participation and Software: What Mozilla Has to Teach Government. MIT Press. p. 81. ISBN 978-0-262-51461-3. ^ a b c d e Barnhart, Aaron (May 3, 2003). "Win like a lamb; C-SPAN remains a reliable source thanks to founder's fair approach". Kansas City Star. p. F1. Retrieved May 22, 2013. ^ a b c d "C-SPAN: The Other Washington Monument". tvnewscheck.com. News Check Media. April 20, 2010. Archived from the original on February 5, 2013. Retrieved November 30, 2010. ^ Mixon, Franklin G. (2003). Legislative Television As Political Advertising: A Public Choice Approach. iUniverse. p. 2. ISBN 978-0-595-27086-6. ^ "Original Cable Guy". college.columbia.edu. Columbia College. Archived from the original on August 29, 2008. Retrieved August 5, 2008. ^ Paddock, Travis (April 8, 1998). "C-SPAN chief says network has 'extended the gallery'". The University Record. Ann Arbor, Michigan: The University of Michigan. Retrieved October 8, 2012. ^ Frantzich, Stephen E.; John Sullivan (1996). The C-SPAN Revolution. University of Oklahoma Press. p. 30. ISBN 0-8061-2870-4. ^ "Election Process Highlights | C-SPAN.org". www.c-span.org. Retrieved April 16, 2019. ^ "Lamb opened government with C-SPAN". Journal & Courier. Lafayette, Indiana. November 3, 2007. p. 6A. Retrieved May 22, 2013. ^ a b c d "C-SPAN By the Numbers". The Washington Post. March 14, 2004. Retrieved May 22, 2013. ^ Frantzich, Stephen E.; John Sullivan (1996). The C-SPAN Revolution. University of Oklahoma Press. p. 23. ISBN 0-8061-2870-4. ^ a b Ruth Marcus (March 18, 2004). "Confessions of a C-SPAN Junkie". The Washington Post. p. A31. Retrieved May 22, 2013. ^ a b c d e Chris Wallace (August 15, 2004). "Power Player of the Week Brian Lamb". Fox News Network. Retrieved May 22, 2013. ^ a b c Tom Shales (April 3, 1989). "C-SPAN, America's Town Hall; Looking Back on the Decade That Brought Government Home". The Washington Post. Archived from the original on November 5, 2013. Retrieved May 22, 2013. ^ a b c d Ragsdale, Shirley (March 14, 1999). "C-SPAN has taken viewers on tour of history, government for 20 years". Argus Leader. Sioux Falls, South Dakota. p. 10C. Retrieved May 22, 2013. ^ a b c d e f g h i "C-SPAN Milestones". c-span.org. C-SPAN. Archived from the original on July 17, 2011. Retrieved October 8, 2010. ^ a b Moss, Linda (February 19, 2001). "Time Warner Gives Lift to C-SPAN3". Multichannel News. Retrieved May 22, 2013. ^ A.B. Stoddard (October 15, 1997). "Rosty to be Released from Custody Today". The Hill. Washington, D.C. Retrieved May 22, 2013. ^ a b Babington, Charles (March 19, 2007). "Radio Deal Could Face Technical Difficulties; XM, Sirius Systems Already Strained". The Washington Post. Archived from the original on August 8, 2014. Retrieved May 22, 2013. ^ a b c d e Stelter, Brian (March 15, 2010). "C-SPAN Puts Full Archives on the Web". The New York Times. Retrieved September 27, 2010. ^ Bromwich, Jonah Engel (January 12, 2017). "C-Span Online Broadcast Interrupted by Russian Network". The New York Times. ^ C-SPAN [@cspan] (January 12, 2017). "This afternoon the online feed for C-SPAN was briefly interrupted by RT programming" (Tweet) – via Twitter. ^ a b c d Hodges, Ann (March 19, 1994). "Historic debates will mark 15 years of C-SPAN". The Houston Chronicle. p. 4. Retrieved May 22, 2013. ^ "American Presidents: Life Portraits". C-SPAN. Retrieved March 7, 2016. ^ "C-SPAN 25th Anniversary Essay Winner". c-span.org. C-SPAN. Retrieved February 27, 2004. ^ "C-SPAN's 24-Hour Call-In Marathon". c-span.org. C-SPAN. Archived from the original on August 19, 2011. Retrieved June 4, 2011. ^ David G. Savage (November 15, 2011). "C-SPAN seeks to air Supreme Court healthcare arguments". Los Angeles Times. Retrieved October 7, 2013. ^ "C-SPAN Challenges Congress to Open Health Care Talks to TV Coverage". foxnews.com. Fox News. January 5, 2010. Archived from the original on November 18, 2010. Retrieved November 22, 2010. ^ "Mini-Health Insurance Policies". c-span.org. C-SPAN. December 1, 2010. Retrieved March 22, 2011. ^ O'Connor, Patrick (November 15, 2010). "More Cameras in the House?". Washington Wire. The Wall Street Journal. Retrieved November 30, 2010. ^ a b Weiner, Rachel (February 4, 2011). "C-SPAN denied cameras in the House of Representatives, again". The Washington Post. Retrieved February 8, 2011. ^ Lamb, Brian (December 14, 2006). "C-SPAN letter to Nancy Pelosi" (PDF). Archived from the original (PDF) on October 1, 2008. Retrieved October 12, 2008. ^ Allen, Mike (March 19, 2010). "Gridiron rejects C-SPAN overture". politico.com. Politico. Retrieved January 27, 2010. ^ Akin, Stephanie (June 22, 2016). "Why You Can't See the House Sit-In on C-SPAN". Roll Call. Retrieved June 23, 2016. ^ Phillips, Amber (June 23, 2016). "C-SPAN cameras couldn't show Democrats' gun control sit-in – so Democrats did it themselves". The Washington Post. Retrieved June 23, 2016. ^ Herszenhorn, David (June 23, 2016). "House Democrats' Gun-Control Sit-In Turns into Chaotic Showdown With Republicans". The New York Times. Retrieved June 24, 2016. ^ "@cspan: C-SPAN has no control over the U.S. House TV cameras". Tweet. C-SPAN Twitter account. June 22, 2016. Retrieved June 23, 2016. ^ Ostrow, Adam (September 26, 2008). "Don't like Twitter's Election Site? C-SPAN Has a Way Cooler Alternative (Really!)". mashable.com. Mashable. Archived from the original on August 8, 2010. Retrieved January 27, 2011. ^ "Viewer FAQs". c-span.org. C-SPAN. Archived from the original on September 25, 2013. Retrieved September 27, 2013. ^ Linkins, Jason (May 21, 2009). "Profiles in Twittering: C-SPAN Builds An Online Bridge". The Huffington Post. Retrieved January 28, 2011. ^ Rollins, Samantha (January 5, 2011). "C-SPAN Goes Social: Streams 112th Congress Live on Facebook". Time.com. Time. Retrieved January 28, 2011. ^ a b Shayon, Sheila (June 22, 2010). "Foursquare Checks into Politics With C-SPAN". Brandchannel.com. Brandchannel. Retrieved November 22, 2010. ^ "Cable Show Draws News of HD Channel Launches". multichannel.com. NewBay Media. May 18, 2010. Retrieved December 3, 2010. ^ a b c "C-SPAN2 to be Added to PRIMESTAR's Channel Lineup" (Press release). C-SPAN. December 4, 1996. ^ a b Linda M. Harrington (October 31, 1993). "C-SPAN: TV's Political Insider in Washington". The Chicago Tribune. Retrieved May 22, 2013. ^ "About C-SPAN". c-span.org. C-SPAN. Retrieved January 25, 2011. ^ "C-SPAN Politics". c-span.org. C-SPAN. Retrieved December 6, 2010. ^ Rothstein, Betsy (October 20, 2010). "C-SPAN Reaches Debate Milestone". mediabistro.com. Mediabistro.com. Retrieved June 19, 2013. ^ a b Nick Gillespie (December 2010). "The Democratizer". reason.com. Reason. Retrieved November 22, 2010. ^ a b c d e Harden, Blaine (May 9, 1996). "Feasting on C-SPAN; Diet of Public Affairs TV Puts Political Junkies Inside Beltway". The Washington Post. Archived from the original on November 5, 2013. Retrieved May 22, 2013. ^ a b Eggerton, John (March 19, 2013). "Exclusive: C-SPAN Study Finds Almost Quarter of Cable/Satellite Subs Watch Weekly Audience is up 4% since last Hart Research survey". Broadcasting & Cable. Retrieved March 22, 2013. ^ Cohen, Andrew (October 8, 2010). "C-SPAN's Supreme Court Broadcasts: Do You Have the Right to Burn the Flag?". politicsdaily.com. AOL. Retrieved October 11, 2010. ^ "BBC Parliament Goes Live on Digital Satellite" (Press release). M2 Presswire. November 25, 1998. ^ "Australian Parliament". c-span.org. C-SPAN. Archived from the original on October 20, 2013. Retrieved July 16, 2013. ^ Kubasik, Ben (April 26, 1994). "Networks planning coverage of Nixon funeral". The Spokesman-Review. Spokane, Washington. Retrieved June 19, 2013. ^ Turegano, Preston (June 14, 2004). "Television did its job as window on America's farewell to Reagan". The San Diego Union-Tribune. p. D-6. Retrieved May 22, 2013. ^ Shannon, Kelley (July 14, 2007). "Lady Bird Johnson, former first lady, remembered at Texas funeral attended by 1,800". Associated Press. Retrieved May 22, 2013. ^ Timpane, John (September 2, 2008). "Coverage of Gustav tops politics on Day 1". The Philadelphia Inquirer. Retrieved May 22, 2013. ^ "Election night 2008". Connect2Canada.com. Connect2Canada. Archived from the original on January 12, 2012. Retrieved December 7, 2010. ^ Former Prime Minister Trudeau Funeral. C-SPAN. October 3, 2000. Retrieved October 18, 2013. ^ Northeastern Electricity Failures. C-SPAN. August 14, 2003. Retrieved October 18, 2013. ^ Northeast Power Outages, Day 1. C-SPAN. September 3, 2003. Retrieved October 18, 2013. ^ "Moammar Qadhafi Address". c-spanvideo.org. C-SPAN. March 2, 2011. Retrieved March 15, 2011. ^ "E-Vision launches C-Span channel on its cable network". Al Bawaba. Amman, Jordan. June 11, 2009. Retrieved May 22, 2013. ^ "C-SPAN's David Irving contretemps". adl.org. Anti-Defamation League. April 13, 2005. Archived from the original on August 1, 2009. Retrieved July 29, 2009. ^ Cohen, Richard (March 15, 2005). "C-SPAN's Balance of the Absurd". The Washington Post. Retrieved June 11, 2013. ^ "Lipstadt/Irving Libel Trial". c-spanvideo.org. C-SPAN. Retrieved March 22, 2011. ^ Reed Irvine (May 10, 1998). "Accuracy in media; Left-Winger's "Truth' Exposed As Make-Believe". Chattanooga Free Press. p. A11. Retrieved May 22, 2013. ^ "America and the Courts". c-span.org. C-SPAN. Retrieved March 22, 2011. ^ Yahr, Emily (October 23, 2010). "TV highlights for October 23, 2010". The Washington Post. Retrieved October 26, 2010. ^ McArdle, John (December 6, 2004). "New Show, Familiar Format For C-SPAN". Roll Call. Washington, D.C. Retrieved September 28, 2010. ^ "The Communicators". c-span.org. C-SPAN. Retrieved January 27, 2011. ^ "'Booknotes' Afterword". The Boston Globe. August 19, 2004. Retrieved May 22, 2013. ^ a b Ellen Emry Heltzel (August 17, 1997). "Books on TV, and a Host Who Listens". The Oregonian. Portland, Oregon. p. F07. Retrieved May 22, 2013. ^ "C-SPAN's 'Booknotes' nearing end". Cincinnati Enquirer. August 12, 2004. Retrieved April 26, 2015. ^ "Editorial". The Sun Herald. Biloxi, Mississippi. September 14, 2003. p. C12. Retrieved May 22, 2013. ^ a b Milliot, Jim (January 10, 2005). "BookTV Eyes More Original Programming". Publishers Weekly. Retrieved May 15, 2013. ^ Estepa, Jessica (July 15, 2010). "C-SPAN2's 'Book TV' Wins Honor For Its Work". Roll Call. Washington, D.C. Retrieved February 8, 2011. ^ Williams, Jenny (January 7, 2011). "Turn to C-SPAN for American History". wired.com. Wired. Retrieved January 17, 2011. ^ Weprin, Alex (January 6, 2011). "C-SPAN Launching History Programming Block". mediabistro.com. WebMediaBrands. Retrieved May 15, 2013. ^ Gerald D. Swick (January 18, 2011). "American History TV – New from C-SPAN". historynet.com. Weider History Group. Retrieved November 22, 2010. ^ "C-SPAN3 to Air Dole Institute Interviews with Bob Dole, Walter Mondale" (Press release). The University of Kansas. November 20, 2009. Retrieved May 22, 2013. ^ Rust, Michael (February 9, 1998). "Americans Speak Up on Talk TV". Insight on the News. Retrieved May 22, 2013. ^ a b Frank J. Prial (December 4, 2004). "After Many Million Pages, 'Booknotes' Ends Its Run". The New York Times. Retrieved May 15, 2013. ^ "Lincoln 200 Years". c-span.org. C-SPAN. Archived from the original on July 15, 2012. Retrieved February 23, 2011. ^ Lynn Sweet (February 6, 2009). "Run up to Lincoln's Thursday 200th Birthday celebration: C-SPAN Lincoln specials". Chicago Sun-Times. Archived from the original on October 17, 2011. Retrieved February 24, 2011. ^ "The Capitol". c-span.org. C-SPAN. Retrieved February 23, 2011. ^ Kennicott, Philip (December 13, 2008). "With Each Tale, 'House' Extends Inviting Lines". The Washington Post. Retrieved February 22, 2011. ^ "The Supreme Court: Home to America's Highest Court". c-span.org. C-SPAN. Retrieved February 23, 2011. ^ "Blair House: The President's Guest House". c-span.org. C-SPAN. Retrieved February 23, 2011. ^ Bauder, David (February 15, 2013). "C-SPAN begins 35-episode series on first ladies". Associated Press. Retrieved February 20, 2013. ^ Gavin, Patrick (February 14, 2013). "C-SPAN views first ladies as political powerhosues". Politico. Retrieved February 20, 2013. ^ "The most popular iPhone news applications". The Independent. March 23, 2010. Retrieved October 11, 2010. ^ a b Kaltenbach, Chris (February 22, 1998). "New station features processes of government; Radio: WCSP-FM (90.1) serves up large doses of public policy as it's happening, but more selectively than C-SPAN". The Baltimore Sun. Retrieved May 22, 2013. ^ "About C-SPAN Video Library". c-span.org. C-SPAN. Retrieved June 4, 2011. ^ a b Reynolds, Mike (September 16, 2010). "ACC Awards Golden Beacon To C-SPAN's Video Library". multichannel.com. NewBay Media. Retrieved September 27, 2010. ^ Cillizza, Chris (March 15, 2010). "Early races for Congress may give forecast for November; C-SPAN presents". The Washington Post. Retrieved September 27, 2010. ^ Raasch, Chuck (March 25, 2010). "Changing the way we view history". gannettonline.com. Gannett News Service Multimedia. Archived from the original on July 11, 2011. Retrieved September 27, 2010. ^ Martel, Frances (March 16, 2010). "C-SPAN Online Archives Will Redefine Social Studies Education in America". mediaite.com. Mediaite. Retrieved September 27, 2010. ^ Brian Williams (September 24, 2010). "C-SPAN Digital Archives". msnbc.msn.com. NBCNews.com. Retrieved September 27, 2010. ^ Howard Kurtz (September 23, 2010). "C-SPAN's blasts from the past". The Washington Post. Retrieved September 27, 2010. ^ "Democratizing the Archive: An Open Interface for Mediation". Metavid. Archived from the original on June 5, 2008. Retrieved October 12, 2008. ^ "C-SPAN Asks Sites to Pull Colbert". Associated Press. May 8, 2006. Retrieved June 11, 2013. ^ Xeni Jardin (May 4, 2006). "Why was Colbert press corps video removed from YouTube?". boingboing.net. Boing Boing. Archived from the original on July 9, 2008. Retrieved October 12, 2008. ^ Cohen, Noam (May 8, 2006). "A Comedian's Riff on Bush Prompts an E-Spat". The New York Times. Retrieved July 5, 2006. ^ Hunt, Kaise (March 7, 2007). "C-SPAN alters copyright over Pelosi flap". Associated Press. Retrieved June 11, 2013. ^ "C-SPAN Takes Lead in Making Video of Congressional Hearings, White House and Other Federal Events More Widely Available to Online Community". c-span.org. C-SPAN. March 7, 2007. Archived from the original on July 10, 2012. Retrieved March 22, 2011. ^ "Copyright Policy for Educators". c-span.org. C-SPAN. Retrieved March 22, 2011. The video coverage of the floor proceedings of the U.S. House of Representatives and of the U.S. Senate is public domain material and is not subject to this license, and as such, may also be used for educational purposes. ^ "C-SPAN Engages New Media Strategies for Innovative Online Convention Coverage". nms.com. New Media Strategies. August 12, 2008. Archived from the original on August 10, 2011. Retrieved December 2, 2010. ^ Nusca, Andrew (September 25, 2008). "EXCLUSIVE: C-SPAN Launches Gadget-Fueled 'Debate Hub' as Social, Political Destination". zdnet.com. ZDNet. Retrieved December 3, 2010. ^ Fitzpatrick, Alex (August 23, 2012). "C-SPAN's Online Hub Provides Raw Convention Coverage". Mashable. Retrieved June 19, 2013. ^ "Solving Video Problems". c-span.org. C-SPAN. Archived from the original on December 21, 2010. Retrieved December 3, 2010. ^ Ganucheau, Adam (July 29, 2014). "C-SPAN to require TV subscription for some programs". USA Today. Retrieved August 4, 2014. ^ Hattem, Julian (July 29, 2014). "C-SPAN limiting access to its online channels". Retrieved August 4, 2014. ^ "National Cable Satellite Corporation[permanent dead link]". District of Columbia Department of Consumer and Regulatory Affairs. Accessed on January 22, 2016. ^ a b c d e f g "Form 990: Return of Organization Exempt from Income Tax". National Cable Satellite Corporation. Guidestar. March 31, 2014. ^ a b "Company/Corporate Information". c-span.org. C-SPAN. Archived from the original on July 17, 2011. Retrieved March 22, 2011. ^ "The Board". c-span.org. C-SPAN. Archived from the original on July 17, 2011. Retrieved December 7, 2010. ^ Touhey, Emmanuel (April 10, 2012). "C-SPAN founder Brian Lamb starts new chapter in his life". The Hill. Retrieved June 11, 2013. ^ "Company & Mission Statement". c-span.org. C-SPAN. January 22, 2013. Archived from the original on January 24, 2013. Retrieved January 25, 2013. ^ Stelter, Brian (March 18, 2012). "C-Span Founder to Step Down as Chief Executive". The New York Times. Retrieved February 13, 2013. ^ Bedard, Paul (June 22, 2010). "Brian Lamb: C-SPAN Now Reaches 100 Million Homes". usnews.com. U.S. News & World Report. Retrieved November 22, 2010. ^ Miller, Tricia (March 18, 2009). "C-SPAN Marks 30 Years of Riveting Television". Roll Call. Washington, D.C. Retrieved February 8, 2011. ^ "Marking 30 years. Covering Washington like no other". c-span.org. C-SPAN. March 19, 2009. Archived from the original on August 19, 2011. Retrieved March 22, 2011. ^ "American Voters Suggest How to Make Congress More Accessible" (PDF). c-span.org. C-SPAN. November 17, 2010. Archived from the original (PDF) on November 28, 2010. Retrieved November 22, 2010. ^ a b Harper, Jennifer (March 19, 2013). "C-SPAN the emerging hipster network: its audience 'trends young'". The Washington Times. Retrieved March 22, 2013. ^ a b Osnos, Peter (March 31, 2009). "Washington's longest-running reality show". The Daily Beast. Retrieved February 8, 2011. ^ Rosenthal, Andrew (October 22, 1987). "C-SPAN's Spotlight Brings Quiet Corners of Campaigning into View". The New York Times. Retrieved June 11, 2013. ^ Zurawik, David (April 27, 2010). "Goldman Sachs hearings: C-SPAN delivers again". Z on TV. baltimoresun.com. The Baltimore Sun. Retrieved December 14, 2010. ^ a b Heffernan, Tim (February 25, 2010). "C-SPAN: Where Health Care (and Everything Else) Gets Debated Daily". The Daily Endorsement. esquire.com. Hearst Communications. Retrieved December 14, 2010. ^ "Randi Rhodes". qanda.org. C-SPAN. December 18, 2005. Archived from the original on July 20, 2011. Retrieved December 13, 2010. ^ David Corn (March 11, 2004). "Happy Birthday, C-SPAN!". Capital Games. thenation.com. The Nation. Retrieved December 14, 2010. ^ Rash, John (March 20, 2009). "It's a fittingly quiet birthday for C-SPAN". Minneapolis Star Tribune. Retrieved February 8, 2011. ^ T.R. Reid (March 18, 2004). "C-SPAN Gauged 25 Years After Start". The Washington Post. p. A21. Retrieved December 14, 2010. ^ Montecino, Juan; Mark Weisbrot (December 2007). "Tilting Rightward: C-SPAN's Coverage of Think Tanks" (PDF). cepr.net. Center for Economic and Policy Research. Retrieved May 22, 2013. ^ "C-SPAN Slanting Right". fair.org. Fairness and Accuracy in Reporting. December 19, 2005. Retrieved June 5, 2013. ^ Harper, Jennifer (December 20, 2007). "Tanks numbers". The Washington Times. Retrieved June 11, 2013. ^ a b c Alice A. Love (August 8, 1994). "C-SPAN Cut in 95 Cities Around the Country For Total Loss of About Four Million Viewers Brian Lamb Says Competition for Air Time May Lead Network to Liven Up Its Format". Roll Call. Washington, D.C. Retrieved May 22, 2013. ^ "Federal Law Forced Paragon into Programming Changes". The Oregonian. Portland, Oregon. January 24, 1995. p. B08. Retrieved May 22, 2013. ^ Bayard H. Morrison (April 8, 2001). "Some of U.S. Want Our C-SPAN2". Orlando Sentinel. Retrieved May 22, 2013. ^ Schlosse, Jim (March 9, 1995). "C-SPAN Carries Political Lessons Across Highways". News & Record. Guilford County, North Carolina. p. B1. Retrieved May 22, 2013. ^ "C – SPAN Launches New C – SPAN Digital Bus and C – SPAN Local Content Vehicle" (PDF). C-SPAN. Archived from the original (PDF) on June 10, 2013. Retrieved September 3, 2013. ^ Tucker, Joanne (July 2013). "How C-SPAN Manages A Cross-Country Fleet". Business Fleet. Retrieved October 7, 2013. ^ Rothstein, Betsy (March 12, 2013). "C-SPAN Rolls Out Second Fleet of Tricked Out Vehicles". mediabistro.com. Mediabistro.com. Retrieved October 7, 2013. ^ C-SPAN (1999). Gavel to Gavel: A C-SPAN Guide to Congress. Johns Hopkins University Press. ISBN 0-8018-6111-X. Retrieved October 16, 2013. ^ Lamb, Brian; C-SPAN staff (2010). Who's Buried in Grant's Tomb?. PublicAffairs. ISBN 1-58648-869-4. ^ Lamb, Brian; Swain, Susan, eds. (2010). Abraham Lincoln: Great American Historians on Our Sixteenth President. PublicAffairs. ISBN 1-58648-774-4. ^ Lamb, Brian; Swain, Susan; Farkas, Mark, eds. (2011). The Supreme Court: A C-SPAN Book, Featuring the Justices in their Own Words. PublicAffairs. ISBN 978-1-58648-835-2. ^ Biffle, Tony (December 5, 2004). "The Last Author of One Last Book For One Final Hour". The Sun Herald. Biloxi, Mississippi. p. B11. Retrieved May 22, 2013. ^ Lamb, Brian (2005). Booknotes: On American Character. PublicAffairs. ISBN 1-58648-342-0. Retrieved October 16, 2013. ^ Lamb, Brian (2001). Booknotes: Stories from American History. PublicAffairs. ISBN 1-58648-083-9. Retrieved October 16, 2013. ^ C-SPAN. Traveling Tocqueville's America: A Tour Book. The Johns Hopkins University Press. ISBN 0-8018-5966-2.